Important: Enabling commit log archiving modifies the Apache Cassandra™ commitlog_archiving.properties configuration file. The archive_commitlog.sh is created when commit log archiving is enabled. If you add nodes to a cluster and commit log archiving is enabled, you must manually copy commitlog_archiving.properties and archive_commitlog.sh to the new nodes prior to starting DataStax Enterprise, or re-enable commit log archiving. If you want to backup the commit logs to a local filesystem location or to a cloud storage provider such as Amazon S3, click Add Location. For more information about Location and Retention Policy, see adding a backup location. 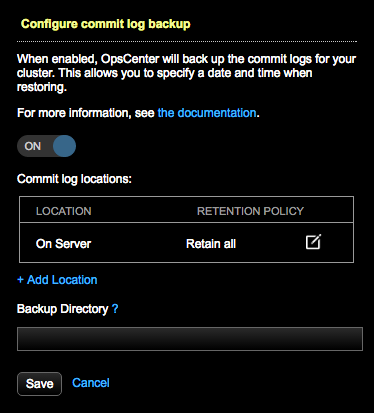 Required: Enter the path in the Backup Directory for staging the commit logs prior to storage on each node. The Backup Directory is configured with the backup_staging_dir option in address.yaml (default: /var/lib/datastax-agent/commitlogs/). The location set under Backup Directory must be writable both by the user running DataStax Enterprise and the DataStax Agent user. The Backup Directory is not to be confused with the Commit log locations, which store backups of the commit logs. The DataStax Agent user and the DataStax Enterprise user are by default the same user. If that is not the case for your environment, see Setting permissions to run the DataStax Agent as the DSE user.